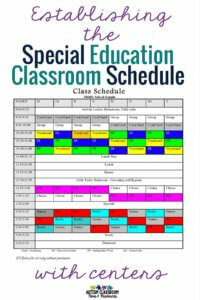 So, our next step in setting up a special education classroom is to develop the classroom schedule. My goal in developing a schedule for the class is to assure that all the individual needs of the students are met but within the context of the classroom. Running 12 individual schedules doesn’t help to move the students to their next environment. 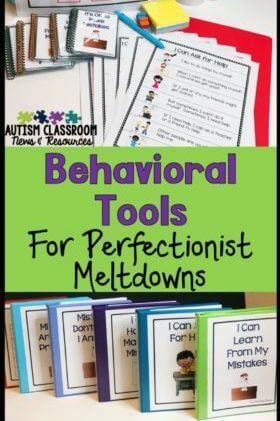 Eventually, even if they struggle with it now, we want them to be part of a classroom group. That requires instruction, even if we start small. In order to know what the schedule is going to look like, you have to know the individual needs of the students. That’s why we completed the teaching implementation plans. 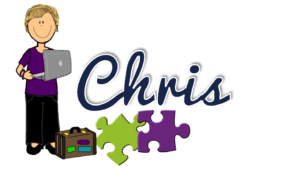 The teaching plans help us to know what type of activities the students’ need, what staff ratios they will need, and what type of instruction is going to be needed in the classroom. I know that the teaching plans feel like a piece of paperwork, but they provide the basis for this next step. 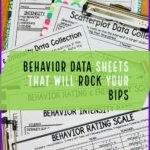 So, pull them out and take a look at the types of activities you will need. I’ve written a good bit about making the classroom schedule in the past. Ideas about the steps and issues you have to decide in making the schedule. We can change up the type of activities they are working on. This works well for those students who need short periods of work followed by an opportunity to be more independent. I use a schedule grid I’ve talked about in this post. I fill in all the nonnegotiables–the things I cannot change. These include things like lunch, specials like music and art, and recess. Anything I don’t control the time of goes on the grid first. Then I figure out when I can find time to have a rotation of centers. With that thought, here are the considerations I go through to determine how to set them up. Do I have a block of time that works well? Sometimes I have an hour or so block in the morning and another in the afternoon. Those are prime time for center rotations. Sometimes I have larger blocks–in those cases, I can break them up with a group activity in the middle. For instance, I could do 2 20-minute centers, then a music and movement time or exercise time. Then have 2 more 20-minute centers. You have 40 minutes and then the kids go to PE and then you have another 20 minutes when they come back before it’s time for lunch. Consider splitting your center rotation around PE time. Have two 20-minute centers before PE and then have the third center rotation when they come back in the classroom. 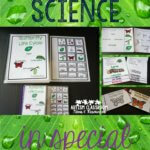 This keeps the students engaged throughout the time and reduces down time or less productive time. It also assures that every student gets to each center activity. How many staff are available? This is going to be the biggest dictator of how many centers I can have. If my students are independent at their work systems, that center can be set up without direct supervision so I might sneak another center in there that way. However, if my students all need supervision then that center has to be supervised and I’m limited by how many staff I have. So, what if you have students who need small groups but you have only 1 or 2 staff besides you, leaving you with groups that are 4 to 5 students for instruction? Think about whether you can have a related service provider, like a speech pathologist, run a center for at least some days of the week. I’ve done this before and had speech run a speech center 3 days a week. She got her hours of work with the students in by pushing into the classroom and we were able to break the class down into smaller groups. How long can the students attend? The length of your centers has to be determined by how long the students can sit and attend to instruction. Can they attend for 10 minutes, 15 minutes or 20 minutes? Do you have a rare class that can handle 30 minute centers? More likely you will have students who attend for different times. You can handle this to some degree by having the students do something semi-independently at the center while you work with other students and then switch. 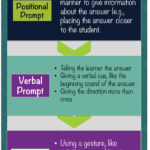 This allows you to create shorter time periods for some students with longer work periods for others. Let’s say you were working on discrete trials with some students, you could give the other students a file folder or something like a color by word activity to work on and then switch partway through the center rotation time. 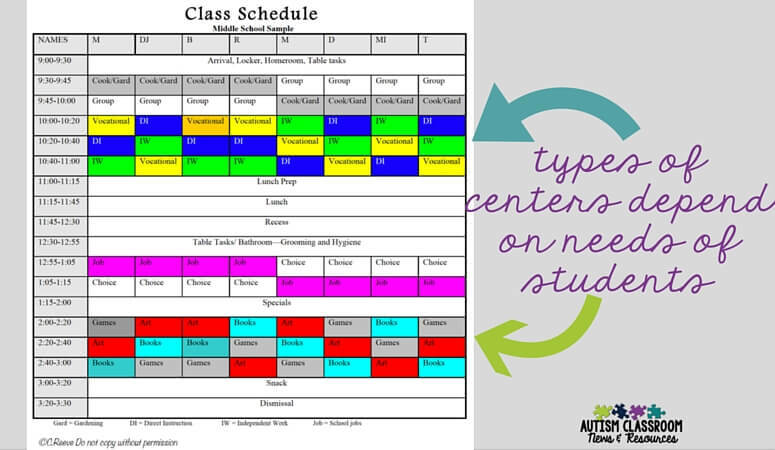 I know it’s tempting to set up the centers so that you have 1-1 time with each student. If you have enough staff to provide 1-1 that’s great. However, if you don’t and you try to put 1-1 time in throughout the day, that often means that the other groups are uneven or you have individual students moving around on their own without supervision (a problem for some students). 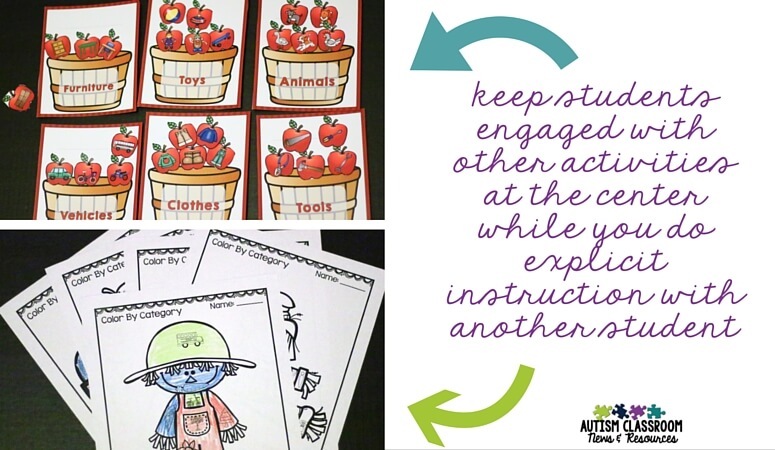 Consider using alternative activities at the same area with you and working with the students 1-1 for part of the center time and taking turns with them. This keeps the students in a place where staff can supervise them, it assures better engagement for many of our students who aren’t independent yet. Clearly when you break the class into centers, you will have ot group the students in some way. You can group them by similar skills or complementary skills. For instance, you have a class with a 4 students who really need opportunities to practice interacting with peers and are working on advanced language skills. You have 2 students who are not independent and cannot stay in their area without supervision. They are working on more basic skills like matching and following directions. Then you have 3 students who are somewhere in between those groups’ skills. You could group the 4 students together and break up the group of 3 by having 2 of them in one group and 1 of the more dependent students in each group. Advantages to this mean that you have the ability to provide supervision to the less independent student. Disadvantage is that you might sacrifice some attention and instruction to the more independent students to supervise the less independent student. On the flip side, you could do the same by breaking up the 4 student group who are very independent. You could also have a group of the 4 independent students, a group of the 3 middle level students and one group of the 2 less independent students. Advantage is that you have like skills together so instruction is easier and the more independent students will get more attention during the centers. A disadvantage is that you will have one center that is going to be challenging for staff to keep the 2 kids engaged. You may need to arrange furniture and engineer the environment to help keep those students more engaged with lots of simple tasks for them to work on during centers and learning to remain in the area. Clearly you have to make the decision that works best for your students with an understanding of the trade offs. Finally, I sometimes get asked about what kinds of centers I have in a classroom. Clearly it depends on the classroom and students, but you will see lots of examples by age in the links I shared above. Often in the morning I will set up an “academic” set of rotations that might include either of the following. Then in the afternoon, I would schedule a set of “leisure” centers that might include games, puzzles, listening center. I might also have vocational centers that might include an independent work center that is vocational tasks, classroom jobs the students have to complete daily, and a center for teaching new vocational skills. It depends on the goals for the students to some degree whether I would do a leisure rotation or a vocational center. Sometimes I can do both, but if I have students who have lots of social goals and need opportunities to really work on the communication and interaction, I would look at more social and leisure skills. For students who are preparing for work, I would obviously include more vocational skills. Again, it goes back to those teaching plans that have all that information in one place. Finally, the biggest issue I see people struggle with their schedule is trying to make it perfect. There is no perfect schedule and it will take time to get it right as you get to see what the students can and can’t do. You will have to make compromises on things. Perhaps your morning meeting isn’t as long as you would like it to be–maybe add another short group in the afternoon. Maybe your center time is not as long as you would like or you can’t group the students in the ideal manner. At this point you may have to tweak some of the teaching plans so that you assure that everyone’s needs are still met, but it may make it less ambitious. For instance, you may find that you can’t have daily data collection during the art center because of the number of students who will be in the group. You’ll have to come back and tweak the schedule and the teaching plans when you create the staff schedules (zoning plans) and when you design the physical space. So, creating the schedule is a fluid process and it takes time to get it working in each classroom. 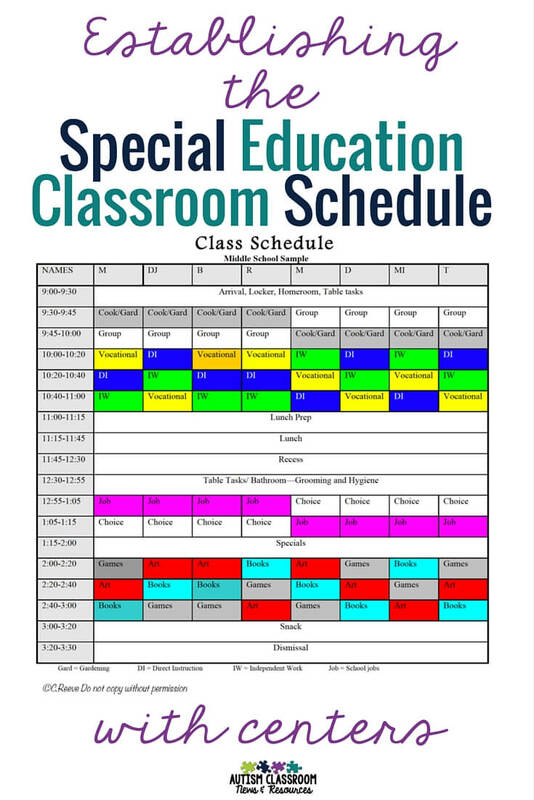 However with some careful planning and referring back to the needs of all the students, you can create a schedule that meets the needs of the all the students as a class and individually. So, got all that? Check out tonight’s Facebook Live video below for an overview of teaching plans and schedule construction. And stay tuned for the two new ventures I have in store–a classroom setup workbook and online courses…more about it in the video.